The Official Newspaper "I Have the Honor"
The Police Educational Complex has become a member since the 7th of May, 2017, and this year it has hosted the representatives of AEPC (Association of European Police Colleges) seven member institutions of Austria, Norway, Germany, France, Romania, Georgia, Ukraine. 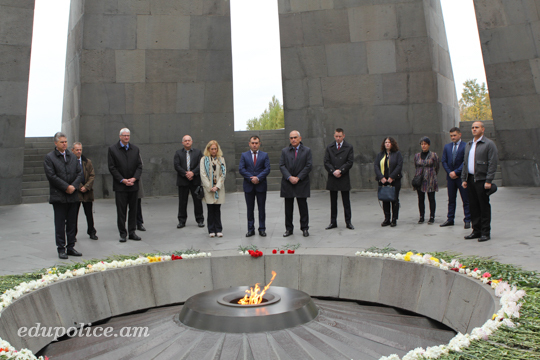 Until the Executive Committee meeting would launch on 7th of November, the leadership staff of the Educational Complex visited the Armenian Genocide museum-institute, met and got acquainted with the fact startling the world, put the flowers on the memorial, immortalizing the memory of the Genocide and respected the memory, dedicated to the innocent victims. Afterwards, the guests arrived to the Police Educational Complex of RA, they were met officially by the leadership staff, managed by the head of the Educational Complex, police major general M. Babayan, and according to his suggestion, the guests gave tribute of respect to the police officers, martyred during the service and Arcakh war and put flowers at the memorial monument. Ahead, the AEPC Executive Committee meeting was launched, the announcement of which was executed by the AEPC president, Head of the Austrian Security Academy of Federal Ministry of the Interior Norbert Leitner. AEPC Secretary General, from the Austrian Security Academy of Federal Ministry of the Interior Peter Lamplot, and AEPC Secretary Mario Krebs, Director Nina Skarpenes and International Coordinator Suzanne Bancel from Norwegian Police University-College, Rector Roman Blahuta and Head of the International Communication Department Vasyl Franchuk from Lviv State University of Ministry of Internal Affairs of Ukraine, Deputy Head of Academy of the Ministry of Internal Affairs of Georgia Miranda Khabazi, Head of the International Cooperation Department Guido Kattert from German Police University, Dean, Prof. PHD Sergiu Adrian Vasile and Police officer Gabriel Virgil Tauber from Romanian Police Academy after «Alexandru Ioan Cuza» and Head of the International and partnership department Pascal Bastide from National Police College of France participated in the meeting. With the headship of Head of Police Educational Complex of RA, police major general Mushegh Babayan, from Armenian side the First Deputy Head, police colonel Tigran Yesayan, Head of International Cooperation and IT unit, police lieutenant colonel Grigori Davtyan, Head of the Law faculty of Academy, police lieutenant colonel Ruslan Marandyan also took participation in the meeting. Mr. Leitner welcomed the participants in the opening speech, and expressed his gratitude to the Head of Police Educational Complex of RA, police major general M. Babayan for the warm reception. Head of Police Educational Complex of RA, police major general M. Babayan had opening speech, greeting the AEPC president Norbert Leitner, as well as other participants of the meeting: «This year it has been decided to held the Executive Committee annual meeting of AEPC in Armenia, therefore, welcome to Yerevan with the best honor and gladness! You are in the city, which has recently celebrated its 2800th anniversary. You will have opportunity to recognize our city, culture and you’ll get sure that though having ancient history, Armenia aspires to be modern, advanced state, keeping its traditions and heritage». Mushegh Babayan added also that in the framework of the reforms, taken place in the Police Educational Complex of RA, it was always essential the study and the implementation of advanced experience into the relevant fields: «Becoming a member of AEPC we strengthened and clarified our executions in the field of international police education. Now it has been created bilateral opportunities for our countries for the education, training, exchange of our experiences within the framework of the police education». The agenda of the meeting was full of various types of issues to discuss. During the two days of the Executive Committee workshop the participants heard different types of reports and proposals, which concerned to the new AEPC membership, the definition of the authorizations for permanent and observer members, the common educational projects, the arrangement of educational thematic conferences, as well as different types of organizational issues. At the end of the first day of the meeting one of the participants, the rector of the Lviv State University of the Ministery of Internal Affairs of Ukraine, PhD of Law, associate professor Roman Blahuta proposed to held the next Executive Committee meeting in the city Lviv. The next day of the meeting, on 8th of November, the participants discussed about the proposals to cooperate with various types of international organizations, a lot of associations of police educational institutions. During the meeting there were short introductions about European Union agency for law enforcement training (CEPOL), Central European Police Academy (CEPA), International association of police academies (INTERPA). Summarizing the outcomes of the Executive Committee meeting, the president of AEPC Norbert Leitner highly evaluated the accomplished works and thanked to the Head of the Police Educational Complex of RA, police major general M. Babayan, as well as other co-workers to implement the event in a high quality.